Yo, Dean Baquet, can you help a brother out? Seems your paper sent another reporter (again) to write a story about Detroit's Corktown (again) and Slows Bar B Q (again) and leave out the minorities (again). There used to be a time in Detroit when the city's populace would be giddy about getting coverage in The New York Times, especially if the paper wrote something flowery about how things are slowly improving. These days, not so much. 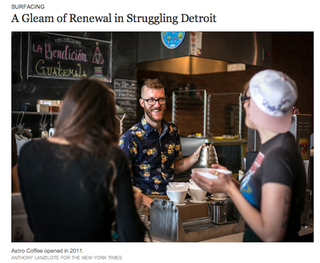 At least three times since the American automotive industry crash, the NYT has rewritten its "here's what's going on in Corktown" story in various forms, focusing on how revival in the (tiny, relatively underpopulated, but significantly white) neighborhood outside downtown. It happened in 2010, 2011 and again yesterday. All three make sure to mention Slows Bar B Q, often a centerpiece of any national coverage of Detroit. Yesterday's story, however, was missing something the others had: Detroiters of color. None in the photos. None in the text. Jesus, even the pictures exclusively feature white folks. Among the three photographs featured, we challenge any readers to point out a single non-Caucasian face. What's up with that, New York Times? At least the last piece you did dropped in on Torya Blanchard! Of course, it's true that Corktown is a Detroit neighborhood that has had its fair share of white residents over the years, but it still rankles us that the New York Times comes to Detroit regularly, but only visits neighborhoods like Corktown and Midtown, almost exclusively covers businesses that are white-owned, white-operated and catering to whites, when Detroit is 82 percent black. You'd think you'd like some representative coverage, yes? If it's done once, it could be seen as an oversight. If done twice, it begins to be troubling. But this is the third piece on Detroit, and it seems to be the least representative of all. Perhaps we should add a qualifier when we discuss the New York Times' interest in Detroit. It isn't really interested in Detroit at all. It's interested in the white minority in certain neighborhoods. That's the "gleam" that catches their eyes. It's not hard to find minorities in Corktown. Aside from the fact that the city is mostly black with the next largest minority being Latino, it's not like there are walls keeping them out. I mean — I was just at Astro Coffee, the coffeeshop pictured in the NYT piece, last week! With other black people! But it's the second time this year the Times has come to Detroit to do a story about new business and focusing solely on those owned by young, white entrepreneurs. To be sure, no one is actually knocking the entrepreneurs' hustle (no one ever does; new business is welcome). But are they the only ones opening new business? It's been consistently proven that the city's newest business owners come from a range of backgrounds, but only certain ones get pushed into the spotlight. The NYT wouldn't be the first offender, though. It's come up a few times; CNN's recent piece about residents being priced out of downtown Detroit only could dig up three white residents; Governing Magazine's "10 People Who Could Help Save Detroit" featured only one black savior, the city's emergency manager. Even locally, black and brown residents are left out of the conversation — the now-defunct Real Detroit Weekly's tone-deaf piece on West Village (still a very black neighborhood) and the renewal going on there, for example. And, as Jackman notes, you can't walk around Detroit without tripping over a minority-owned business — even in the "white" neighborhoods like Corktown. Jackman notes that Rachel's Place, a neighborhood boutique, is regularly overlooked. The hottest new restaurant in Midtown, The Grille at Midtown, is owned by a black family. Though I was critical of their message, a new vodka distillery opening soon is fronted by three women — two of which are black. Minority business owners — there are 30,000 of them, at least — seem to make or sell all the things that make an East Coast hipster drool (hand-dipped candles, tacos, T-shirts, boutiques in warehouses) but can't be put on the same pedestal with the male model from New York who decided to make macaroni by the train station. So what gives? Are reporters color-blind or lazy? Maybe a bit of both.